1. Brainstorm: Choose your topic and let your imagination run wild. 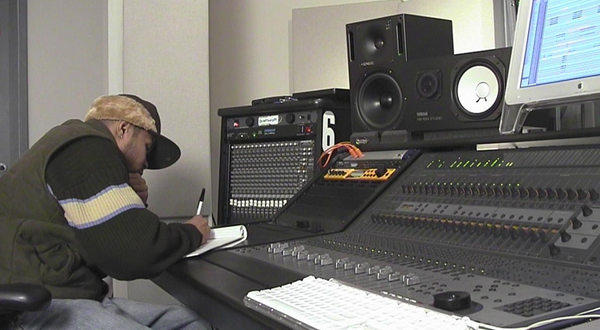 To get started, many artists freestyle for a bit and write down every thought, idea, and emotion that comes to mind. Use this as your inspiration. 2. Create a hook: The basic layout for a rap is intro, verse, chorus, verse, chorus, verse, bridge, chorus, outro. Many rappers start writing the hook (chorus) first. The hook captures the theme of the rap, and conveys its message to the audience. Rappers and lyricists in general start with this because the chorus is what people remember and take from a rap. It sets the rhythm and flow, and inspires what is said throughout the rap. 3. Write lyrics: Use the brainstorming you did along with your chorus as a guide for what you are writing about and to build onto your ideas. Keep in mind that you have to maintain a rhythm since rap is music as well as poetry, and both follow a beat. Some lyricists listen to a beat as they write to help keep their rhythm. 4. Be personal: Don’t lie in your raps about who you are, but to get your point across, you might want to use use hyperbole (exaggerating to the extreme). Typically, lines rhyme in a rap, but the words don’t have to match exactly--it all depends on how you say them (for example: orange:storage). Always keep your message and audience in mind. 6. Memorize: Being able to recite your words from memory allows you to keep the flow and rhythm of it. So practice, practice, practice! Read and reread your piece until you’re sick of it. Play around with the tempo to see what sounds better with your style. Just don’t rap too fast--you might trip up on your words. 7. Rap and share: With the rhythm down and the words engraved into your memory, you’re ready to rap. Record yourself rapping in front of a crowd or even alone in your room and share it on the site along with the lyrics! Let your (rap) voice be heard, and get going on your next masterpiece.